This book is a detailed and learned account of Christian-pagan relations in the first five or so centuries in the Roman Empire. It is good to read a book by a scholar who knows his/her subject well, and this book does not disappoint in this respect. Christopher Jones is a professor of Classics and History at Harvard, and his book is a much needed investigation into an area that has been oft-overlooked. We are apt to read of a dying paganism fading under the pressure of a dynamic Christianity, but we hear too little of the religious life of pagans in the first half of the first millenium, and certainly not enough about the pagan opposition. This book redresses the balance. This is a book of classical history. As such it addresses persons, institutions and events, and while it refers to religious ideas, it is not primarily a history of ideas and is certainly not a book of theology, Christian or pagan. Nor is it a work of philosophy. Ideas are not evaluated in the book, and you will find no argument for Christianity or paganism. The author displays the depth of scholarship that one would expect from an emeritus professor who has devoted his life to study. He has a comprehensive grasp of literary and historical sources from the classical period and can use the knowledge gleaned therefrom to construct a very learned text. Yet he does not fall into the academic trap of unnecessary verbosity. The clarity of writing is of high standard. This is what we find in a scholar who has achieved a high level of familiarity with his subject matter. The first chapter is devoted to an analysis of the terminology of the debate, and here the author makes a positive contribution to our understanding. He sees the term pagan as a polemical term rooted not in paganism itself, but in the language of its Christian opponents. This gives food for thought about how the word is to be used in our modern usage. Constantine is a given a chapter to himself, as befits his seminal role in the establishment of Christianity. The author deals with the historical intrigues that gave rise to Constantine's accession, but also deals with the vexed question of his religious beliefs. The issue of how genuine was his Christianity is raised, but never satisfactorily answered, as it cannot be at a time so far removed from him. Jones observes that Constantine's family had pagan monotheist beliefs, in addition to his mother being a Christian. The role of emperors, such as Theodosius, Gratian and Justinian, is given detailed study, as far as can be possible in a short volume. Yet this is a problem with the book. Though well written it is relatively small, and as historical material is detailed, the text can overload with historical fact. Yet it is a book that is beautifully written. I cannot say that I have absorbed all the facts, which are too detailed for full recall, but this is a book that one ought to read to take from it what information is required. Perhaps a lacuna in the book is that it does not evaluate. The issue of whether or not emperors ought to have interfered in religious issues should have been raised. While it is beyond the scope of Classical history to evaluate philosophical and religious questions, there might have been more analysis of historial consequences of this intervention. The author has refrained from addressing the moral issue of whether or not Christians ought to have been as intolerant as they were. This is perhaps beyond the scope of a historical volume, though information about the way in which Christians understood pagan cults might throw some light on this. Many Christians were convinced that demons fed on the smell of sacrifices, and so thought that sacrifices were in effect feeding the Devil's hordes, which is why they wanted them banned. Though a Christian, I cannot but feel for the pagan victims of religious intolerance. When reading of a much loved shrine being smashed up I get the same sadness as I feel when I read that ISIS have demolished Shiite Mosques and Christian churches. This book does not always present a pretty picture of the antics of Christian zealots, some of whom have reached the rank of sainthood, e.g Cyril of Alexandria, whose thuggish followers were responsible for the murder of the pagan philosopher and mathematician Hypatia, though he did not authorise her killing. I am not always convinced by everyone who has been accounted a saint. Religious fanaticism is an ugly affair, and this work shows it in operation. Perhaps, though, the fanatics who burn down temples are a noticeable minority. However, having been a cleric, I am under no ilusion about the level of tolerance to be found among clerics. Between Pagan and Christian provides a detailed analysis of the varied history of East and West, and of specific areas in each. It examines various significant Pagans, though the analysis of Christian saints is not deep. There is a good examination of paganism in Greece, particularly Athens, in the Christian period. What did interest me is the way in which Eastern Christianity was pressurised by Islam. The fact that many pagans in the East went underground indicates that many nominal Christians were secret pagans, who may have been glad to see the back of their persecutors when the Muslim Arabs finally arrived in the 630s. An analysis of the religious life of the Middle East might fruitfully take into account the presence of residual pagan thinking in the region. Certainly when we see Shities in Lebanon slashing themselves we are reminded of the cult of Attis, once prevalent in that area. Did ideas linger on? Gibbon's picture of a dying paganism confronted by a dynamic Christianity was only ever partly true. Some elements of paganism died, such as belief in the twelve Olympians, whose cultus was, according to Jones, more of a literary construct from Hesiod than a reflection of ordinary pagan belief. This book shows that rather than having a dying paganism, we are dealing with assisted dying, and this was no mercy killing. I am left with the conclusion that the best way forward in religion is the way of peace and non-oppression. This book is worth reading and retaining on one's shelf as a valuable reference work. A good example of a festival with pagan roots is Easter. It stems from Jewish Pesach, Passover, which probably arose as a Spring festival, but became the time when Jews celebrated their deliverance from Egypt; later on it became a celebration of Jesus' death and resurrection. The official Christian name for the festival is Pasch, but the English name for this festival, Easter, is a pagan name derived from Eoster, a dawn/Spring goddess. This is because the Anglo-Saxons imposed some of their own names on Christian festivals. Violence in any form by anybody is going to bear very, very painful bearings. All religions have tried to explain that. I do not know how ISIS and terrorists in the world justify such gruesome acts. Reading your article brought a new perspective of Pagans and the distinct differences between Pagans and Christians. Many festivals that we celebrate have pagan origins, and now we know them as festivals celebrated by Christians and perhaps Jews( I am not sure though). I see now. In some ways the timing of the birthday of Jesus was pragmatic, as it was politic to fit into the festivities that attended Mithras. But there is also the point that there is a sacred cycle of the year, as you know from your own festivals, which follow the seasons. This cycle, well established for millenia, exercised a pressure to fit Christian feasts into its structure. Thus the paschal feast is known by the pagan name Easter in this country, and it is linked to a pagan spring festival. Christmas is close to Yule. Even now there is a tension between the natural cycle of feasts and the Christian cycle. Easter is clearly a recalling of the resurrection, but there is also the more ancient celebration of Spring that does not go away [nor should it.] Christmas is still a midwinter festival. Mayday is not part of the main liturgical structure of Catholicism, though it is important. It is no co-incidence that May is the month of Mary, as it was sacred to the goddess. Having May as the month of Mary was the result of popular pressure. The people just did what they wanted and the established church had to go along with it. I have no issue with the ancient cycle living on underneath the Christian cycle, but my concern is with secularisation. Our parish priest used to say that in December many people celebrate the winter solstice shopping festival. Give me Yule anyday. I meant like shifting the Nativity to December 25th, in order to accommodate Mithras etc. Turning Pagan elements into Christian ones, so that they may be assimilated. There are certain elements in Christianity that have affinities with pre-Christian practice, these including the honouring of saints and sacred places and objects, and also the sacred meal, the Eucharist [the Eucharist goes back to Jesus himself]. Catholicism held onto these elements, Christianizing them in the process. Certainly the cultus of Mary inherited much from the cult of Isis, and probably filled the gap left by the decline of that cult, the need for the sacred feminine. It was these elements that Protestantism stripped away. Jones, writing in Between Pagan and Christian, observes that both pagans and early Christians inhabited the same conceptual world, so it is inevtable that there are some affinities in praxis between them. What exactly do you mean by merging strands? This certainly sounds like a book which ought to be in my library. Thanks for the heads up. It presented a different picture to that which I'd imagined for the east too. I thought it was all about merging various strands, then calling it Christianity and working over the centuries to ease the Pagan bits back out. I'm with you in that religious intolerance in all its forms is ugly, and that includes modern day Pagans picking on Christians. Ancient Rome was a republic and then an empire that existed for almost a thousand years. 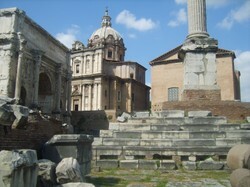 Today's world has inherited a wonderful heritage from ancient Rome. Medicine was conceived in sympathy, and born out of necessity; and the first doctor was the first man and the first woman.